Providing you the best range of 2 pin 15 amp american / japanese plug and 3 pin 15 amp north american plug with effective & timely delivery. The Type A electrical plug (or flat blade) is an ungrounded plug with two flat parallel pins. Although the American and Japanese plugs appear identical. The natural pin on the American plug is wider than the hive pin, whereas on the Japanese plug both pins are the same size. Asa result Japanese plug can be used in the US but often not the other way around. The pin on Type A & Type B Plugs have a hole near the by that fits into 'bumps' found on the contact wipers of some socket, so that the pin is gripped more tightly allowing for better contact and also to prevent the plug from slipping out of the socket Some socket have spring-action blades that grip the sides of the pin, marking the hole obsolete. 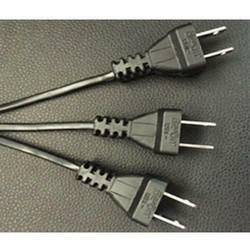 The type B electrical plug has two flat parallel pins and a round grounding (or earth) pin is Longer than the other two so that the device is grounded before the power is connected.As with the type A plug,the amrican and japness version very slightly.